UConn fans in the student section, who had been cheering wildly seconds before, look stunned as Texas player Jonathan Holmes hit a three-pointer at the buzzer to give 7th ranked Texas a shocking 55-54 win Sunday before 10,167 at sold-out Gampel Pavilion. With 2.2 seconds left and the Huskies in the lead, it was all over for Texas and the fans rejoiced. But they would be wrong. A clutch 3-pointer at the horn changed everything. The photo says it all. Take a close look and feel their pain. 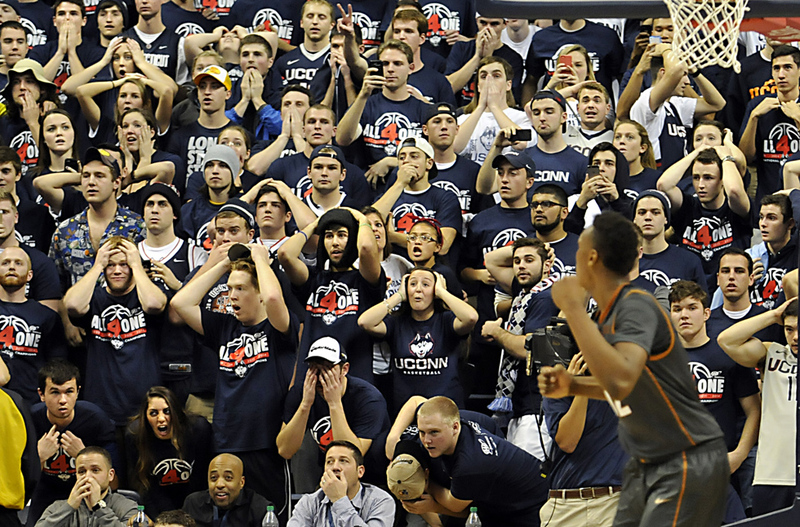 STORRS 11/30/14- UConn fans in the student section, who had been cheering seconds before, look shocked as Texas player Jonathan Holmes hit a three-pointer at the buzzer to give Texas a shocking 55-54 win Sunday.